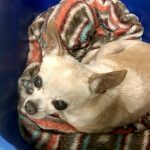 Comments: Amigo wants to be your friend, your baby, your lap buddy-not too much of a wish list for this sweet little senior man. He loves attention from his people, and a little girl dog to snuggle with would be an awesome bonus  He isn’t much of a barker unless you are slow getting his dinner down;-) Amigo gets along well with all sizes of dogs in his foster home. He’s absolutely adorable and can’t wait to find someone who appreciates him.